So what exactly is Branch? And what's Medium? Sometimes we all want a bit more meat on the bones. I don’t want to just sit there are and read about what’s coming up; I want to know what’s around now, what’s just launched and how I can use it. Blogger was a step forward when it launched. Then Twitter came along and MADE CONVERSATION RELEVANT AGAIN (sorry, had to over-exaggerate). Now the guys behind both of these platforms (Ev Williams and Biz stone) have launched two new sites, Medium and Branch. I’ve been having a play - here’s what I think of them so far. Branch is a site that uses the desire for instant, relevant conversations that spring up on Twitter, and found a way to encourage longer conversations around a single topic. Twitter is a fantastic communication tool, but it’s not really a social platform on which you can debate easily with more than a few people due to character restraints. Why should you care? It’s simple – you can take a conversation from Twitter and expand on it - turn it into a debate, argue, agree, whatever. 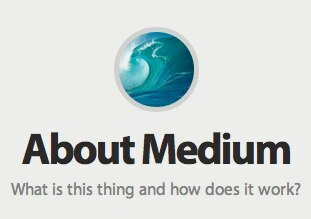 What is Medium? At it’s core it’s a site that allows you to curate and create content without the hassle of having to own a blog, or sign up to Tumblr. It’s aim is to ‘Rethink publishing from scratch’. You can share stories, pictures and other content without the burden of having to be a ‘publisher’. I can understand that, and I can see how that would be appealing to people. I know more than a few people who have cringed at the thought of having to set up a blog. With Twitter, Facebook and Tumblr being around these days, it’s barely worth investing the time if you want to reach people (unless you have a subject you care passionately about - I think blogs are great for single-issues that you care about). Personal blogging however is very difficult to sustain, and having a site like this that basically says ‘share what you like, read what interests you, no pressure to feel like you have to constantly contribute to score points’ (hello, Quora). Some people don’t want to be active sharers - they just want to share, look at and like cool stuff - stories photos etc. Will Branch and Medium survive? It’s too early to tell, as they’re both very much in beta. But I can tell you one thing - I think they both scratch a necessary itch online, and that’s a good thing. You might remember me sharing this video on my Facebook page a few weeks ago (if not, then head on over and like The What Noise on Facebook now). I just wanted to share this on the blog with you all because I think it's a fantastic example of a public-funded broadcasting organisation appealing for donations. 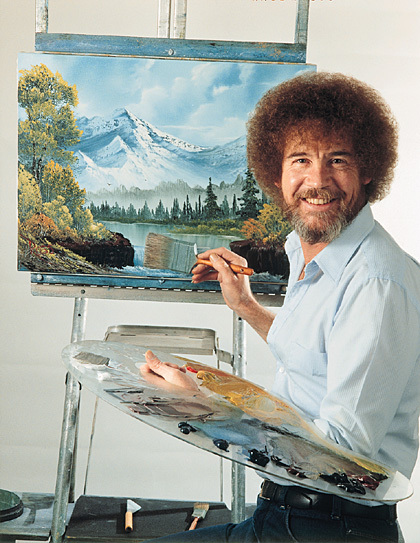 I always used to see pics of Bob Ross when I was wandering around Southampton in my teenage years, past all of the arts and craft shops that populated the outskirts of our city centre. And when you're young, you just look at an old guy with frizzy hair flogging painting wares and have a bit of a laugh at him - because you're dumb at that age, and trying to impress girls with your rubbish sense of humour. This video works because it takes one of PBS's most popular shows, auto-tunes it (which never gets old if it's done correctly), and turns it into an upbeat tribute to the educational and uplifting power of good public broadcasting. It pulls on the heartstrings, makes you feel good, and encourages you to donate through the power of humour, nostalgia and fun, rather than simply holding out a begging bowl and peering sadly into the camera - or trying to exploit you. Seeing as it's just over a year after Google launched it's first social product, I decided to do some digging and look into some of the statistics behind the reports of dizzying growth, and being the fastest-growing social network of all time. So that information certainly poses a few questions for Google+ in the future. Personally, I don't think that the ultimate aim for Google+ is to own the social space. It would be spreading itself too thinly to do that, and besides, I don't think they'll ever knock Facebook off their perch, even if they tried. I don't want to comment along gender lines on this. Too much is made of the fact that Pinterest is a site heavily-frequented by women. You don't hear people talking about Facebook or Twitter in these terms, and I don't think it's fair to judge a social network along cutesy gender lines - whether it's a twee-fest or a sausage-fest is irrelevant - what is relevant is whether it's helping people connect in an effective, meaningful way. 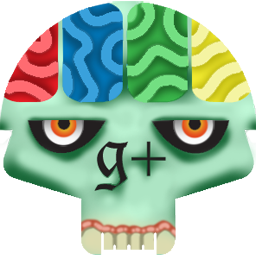 I think Google+ could become the King/Queen of this wave of niche networks - social networks you can form that are based around interests, rather than strong ties. It's totally independent and unreliant on Facebook - unlike Pinterest and Instagram, which both rely heavily on being built into Facebook's open graph or Twitters app ecosystem - meaning the only whims it's subject to are the whims of Google, and the direction they want to go in. It will remain niche, but niche on a large scale - a place to share updates with like-minded people. And, like most niche networks, it's not for everybody - so don't expect your mum or dad to be on there any time soon - but expect to see plenty more savvy niche brands and interests start to find their home there in the next year.